Dubai, UAE: A high-level delegation from Dubai Chamber of Commerce and Industry recently visited Shanghai and Shenzhen and where they met with public and private sector stakeholders and discussed prospects for expanding Dubai-China economic cooperation in several areas of mutual interest such as innovation, smart city solutions, technology, manufacturing and tourism. The delegation was led by H.E. Hisham Al Shirawi, 2nd Vice Chairman of Dubai Chamber, and joined by Omar Khan, Director of International Offices, Dubai Chamber; and Daniel Sellers, Head of Dubai Chamber China Office in Shanghai, who held several meetings with government officials and business leaders representing leading Chinese companies. During meetings in Shanghai, the Dubai Chamber delegates met with the management teams of Chinese electric vehicles startup Aiway Vehicles and global technology and innovation company PeopleNet Security Technologies Co., and explored prospects for the two Chinese companies to expand their footprint and activities to the Dubai market. Dubai Chamber hosted an annual reception Gala Dinner in Shanghai to celebrate Chinese New Year that was attended by dignitaries and other public and private sector stakeholders. During the reception, H.E. 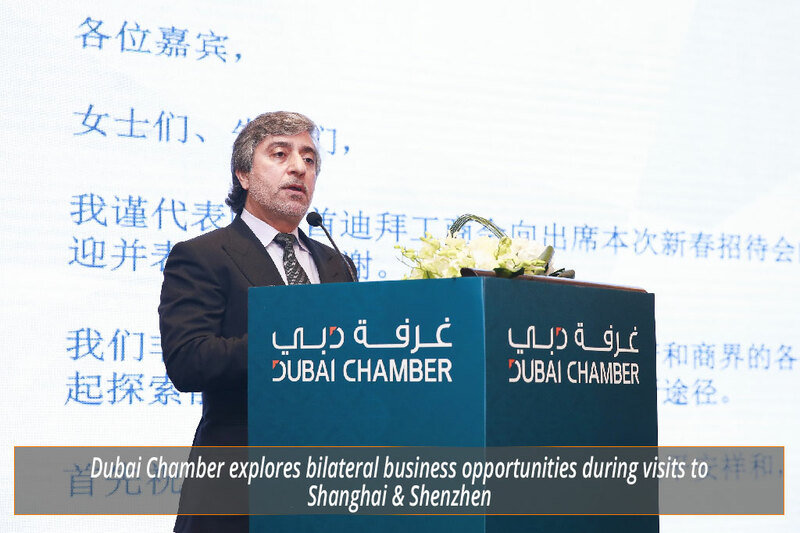 Al Shirawi noted that Dubai Chamber attaches great importance to the Chinese market and briefed attendees about the Chamber’s expansion strategy, part of which is focused on identifying business opportunities in the Chinese market through its representative office in Shanghai. H.E. Al Shirawi pointed out that Dubai Chamber has organised several missions to various cities in China in recent years, including Chengdu, Wenchuan, Shenzhen, and Shanghai, which familiarised Dubai-based companies with business opportunities in the Chinese market. “Over the last few years, the volume and value of Chinese investments in the UAE have increased considerably in recent years. To add to that, China is one of the top source markets for Dubai’s tourism sectors, as the emirate attracted 770,000 Chinese visitors in the first 11 months of 2018, marking a 12 percent increase compared to the same period in 2017. These figures reflect growing confidence in Dubai as a preferred market for Chinese businesses and tourists,” H.E. Al Shirawi said. During a visit to Shenzhen, the delegates met with officials from the Shenzhen Foundation for International Exchange and Cooperation (SFIEC), Shenzhen Federation of Returned Chinese Overseas Entrepreneurs, China Federation of Overseas Chinese Entrepreneurs, and the Guangdong International Overseas Chinese Chamber of Commerce, as well as executives from Tencent, the company behind Wechat, a popular Chinese app. Discussions focused on the recent signing of a cooperation agreement between Dubai and Shenzhen which is expected to pave the way for new collaboration opportunities, while officials also highlighted common goals, synergies and a similar strategic vision shared by the two cities. The delegation visits to Shanghai and Shenzhen came after Dubai Chamber’s Shanghai office organised a trade mission to Dubai where businessmen representing several leading Chinese companies specialising in smart city solutions attended GITEX Technology Week 2018 and met with several leading government entities in the emirate.